On January 20 2018 several members of the Paynes Prairie chapter traveled to Ashton Biodiversity Research and Preservation Institute (ABRPI). Chase Pirtle, the animal care specialist and habitat manager met us at the gate. 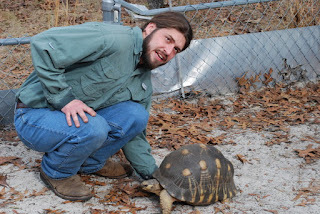 Chase is an authorized Gopher Tortoise Agent and an instructor and private land manager for the Eastern Diamondback Conservation Foundation. He also holds a FWC venomous license. We drove in to the Headquarters and met Maggie Curtis, also a biologist at Ashton who assists Chase in the management of the facility. The headquarters also serves as an incubator, nursery and cold weather shelter for the tortoise collection. In large tubs and kiddy pools filled with pine needles and turkey oak leaves are several Radiated Tortoises (native to Madagascar) and a Yellow Footed Tortoise (native to South America). Who Doesn't Love a Cocoplum? 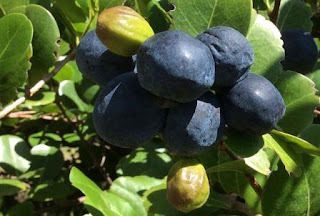 Easy to grow here in Martin County with dark purply-blue plums, occasionally white, or unusually pink. Wildlife hide and feast among the offerings of Chrysobalanus icaco. In the planned landscape cocoplum's full leafy branches work well as screens, or they can be shaped within garden islands, and even survive buzz-cuts in parking lots. Naturally they grow in South Florida swamps, moist forests, coastal beaches and thickets. Post hurricane their naked branches re-bud and grow new leaves without much fuss. If you've been around for a while you might know us as the "Cocoplum Chapter." The name was always Martin County but somewhere along the way we picked up the Cocoplum tag. For clarity and with a nod to the Martin County difference we've reclaimed our true name. But it's no big deal if you want to keep calling us cocoplums. They are, after all, very sweet in so many ways. 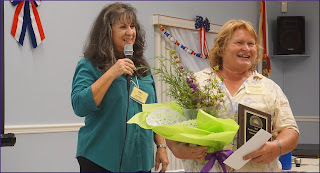 The Citrus Chapter awarded chapter member, Barbara McCormick the 2018 Green Palmetto Award for Education at our Sept. 4th chapter meeting. The nomination letter was read to the audience. The chapter also gave Barbara a gift card as a thank you for all she does for our chapter along with a bouquet of native bloomers. Barbara's nomination letter is below. University of Disney Garden program while attending Valencia College.